Anxiety disorders, which include panic disorder, generalized anxiety disorder (GAD), posttraumatic stress disorder, phobias, and separation anxiety disorder, are the most common class of mental disorders in general population. The estimated lifetime prevalence of any anxiety disorder is over 15%, while the 12-month prevalence is more than 10%. Prevalence estimates of anxiety disorders are generally higher in developed countries than in developing countries. According to the World Mental Health Survey, 2005, lifetime prevalence of panic disorder is 4.7%, GAD is 5.7%, social phobia is 12.1%, and for specific phobia is 12.5%. Anxiety disorders are impairing psychiatric disorders which produce significant distress, disability, and burden. The course of all anxiety disorders is usually chronic; with enduring symptoms and impairment in social functioning lasting years after disease onset. Onset is frequently early in life, between the age of 20 and 30 years, and anxiety disorders are more common in women than in men. There is a considerable impact on the family of patients of anxiety disorder. It is well established that individuals with anxiety disorders experience significant impairments in social and occupational functioning. There can be considerable impact of patient's illness on the family. This can be in the areas of social relations, functioning, and mental and physical health of other members.,, However, the impact of anxiety disorders on family members has not been adequately studied. The study aimed to assess the burden of care on key relatives of patients suffering from anxiety disorder (except obsessive compulsive disorder [OCD]) and to study various sociodemographic and clinical variables of the patients in relation to burden of care on key relatives. The sample of study comprises all diagnosed cases of anxiety disorder (except OCD) attending adult psychiatry OPD of the Department of Psychiatry, King George's Medical University, Uttar Pradesh, Lucknow. Patients above 18 years age who had been diagnosed with anxiety disorder (except OCD) according to International Classification of Diseases, Revision 10 (ICD-10) Diagnostic Criteria for Research (DCR) with a minimum duration of 1-year of illness were considered for the study. Those who had given informed consent and had a key relative were included in the study. Informed written consent had also been obtained from key relatives. Patients with mental sub-normality, any other diagnosable psychiatric disorder, significantly disabling physical condition, or any major medical/surgical illness were excluded from the study. Patients, whose key relatives were not willing to participate in the study, were also excluded. Key relatives of patients who were above 18 years age, ready to give informed consent and caring for the patient for a minimum duration of past 1 year were included in the study. Those key relatives who had mental sub-normality or currently having any psychiatric illness or history of the same during past 1-year were excluded. Key relatives having any physical illness which may significantly interfere with care giving were not considered in the study. First two patients and their key relatives on specified OPD days, who satisfied the selection criteria for the study, were included in the study. Detailed history and clinical evaluation was done. Details of key relative were recorded on semi-structured proforma for key relatives. Key relative were assessed on burden assessment schedule. If due to any reason these evaluations were not possible on the same day, the evaluations were carried out on a mutually convenient day. For assessment of patients and their key relatives, separate semi-structured proformas were used. For assessment of psychiatric condition, Schedules for Clinical Assessment in Neuropsychiatry and ICD-10 DCR  were used. International Personality Disorder Examination was used for exclusion of patients with personality disorder. Burden assessment schedule developed by Thara et al. was used for assessing the burden of care. Out of forty items, which are rated on three point scale, four items were to be answered only by spouses. Thus, when total burden was calculated, it was out of maximum score of one hundred and twenty for those key relatives who were spouses and out of maximum of 108 for those key relatives who were family members other than spouses. To overcome this discrepancy, we calculated an adjusted burden score for each patient using the formula: Score obtained/maximum score × 100 which was taken as total burden score. With this arrangement as a score of 33 means, there is no burden. Score from 33 to 55 is mild burden, 56–77 is moderate burden, and 78–100 is severe burden. Data obtained were analyzed by using appropriate statistical methods. Statistical analysis was done by using the software SPSS (SPSS for Windows, Version 16.0. Chicago, SPSS Inc). Analysis of variance (ANOVA) and Tukey's multiple comparison test were assessed by the statistical software. A total of 321 patients were screened, out of which 169 patients had satisfied the selection criteria. Out of these 169 patients, key relatives of 91 patients had satisfied the selection criteria. Hence, the study sample was 91 patients and their 91 key relatives. The key relatives were mostly in the 31 to 40 years of age groups (29.7%), males (64.8%), Hindu (68.1%), belonging to urban background (64.8%), nuclear type of family (63.7%), married (92.3%), graduate and above (37.4%), family income up to 2500 rupees per month (47.3%), and mostly in service (36.3%). Out of the sample of 91 patients – 47 patients were suffering from GAD, 18 patients had anxiety not otherwise specified (NOS), 12 patients had panic disorder, and 14 patients had phobic disorder. Total adjusted burden score in our study was 40.41 which fall in the category of mild burden. Maximum burden was found in the domains of physical and mental health (7.48 ± 1.74) followed by external support (6.81 ± 1.60), caregiver routine (5.62 ± 1.02), and taking responsibility (5.43 ± 1.53). 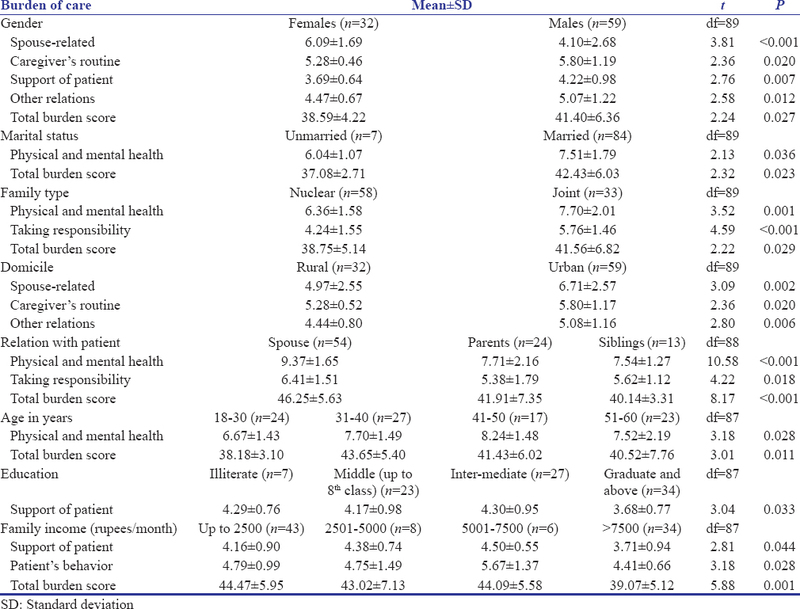 The burden of care on key relatives were compared on different demographic parameters such as – gender, marital status, family type, domicile, age, level of education, family income, relationship with the patient, occupation, clinical subtype of anxiety disorder, and duration of illness in [Table 1] and [Table 2]. The burden of care on key relatives according to gender (males or females), marital status (unmarried or married), domicile (rural or urban), relation with patient, age, education, family income, and family type (nuclear or joint) is summarized in [Table 1]. The t-test revealed statistically higher burden in the domain of spouse related between females as compared to males (t = 3.81, P < 0.001) whereas significantly higher burden in the domain of caregiver's routine (t = 2.36, P = 0.020), support of patient (t = 2.76, P = 0.007), other relations (t = 2.58, P = 0.012), and total burden score (t = 2.24, P = 0.027) between males as compared to females. Statistically significant higher burden in the domains of physical and mental health (t = 2.13, P = 0.036) and total burden score (t = 2.32, P = 0.023) was observed in married as compared to unmarried. The t-test revealed statistically significant higher burden in the domains of physical and mental health (t = 3.52, P = 0.001), taking responsibility (t = 4.59, P < 0.001), and total burden score (t = 2.22, P = 0.029) between joint family as compared to nuclear family. Statistically significant higher burden was seen in the domains of spouse-related (t = 3.09, P = 0.002), caregiver's routine (t = 2.36, P = 0.020), and other relations (t = 2.80, P = 0.006) between urban as compared to rural. On ANOVA, statistically significant difference was observed in the domains of physical and mental health (F = 10.58, P < 0.001), taking responsibility (F = 4.22, P = 0.018), and total burden score (F = 8.17, P < 0.001) across different relations. Tukey's test had revealed significantly higher burden in the domain of physical and mental health in spouses as compared to siblings (P < 0.001), while significantly higher burden in the domains of responsibility (P = 0.036) and total burden score (P = 0.002) in spouses as compared to parents. However, significantly higher burden was observed in the domain of total burden score in spouses as compared to siblings (P < 0.001). ANOVA revealed statistically significant difference in the domains of physical and mental health (F = 3.18, P = 0.028) and total burden score (F = 3.91, P = 0.011) across different age groups. On ANOVA, statistically significant difference was observed in the domain of support of patient domain among the four education groups (F = 3.04, P = 0.033). Tukey's test revealed statistically significant higher burden in the domain of support of patient between “education group middle school to intermediate” as compared to “education group graduate and above” (P = 0.038). ANOVA revealed statistically significant difference in the domains of support of patient (F = 2.81, P = 0.044), patient's behavior (F = 3.18, P = 0.028), and total burden score (F = 5.88, P = 0.001) among income groups. Tukey's test revealed significantly higher burden in the domain of patient's behavior (P = 0.021) between “income group Rs. 5001–7500” as compared to “income group >Rs. 7500” (P = 0.021) while burden was also found to be significantly higher in the domain of total burden score (P = 0.004) between “income group up to Rs. 2500” and “income group > Rs. 7500” (P < 0.001). The burden of care on key relatives according to patient's disorders (GAD, anxiety NOS, panic disorder, and phobia) and illness duration is summarized in [Table 2]. On ANOVA, statistically significant difference was observed among the disorder groups in the domains of physical and mental health (F = 4.30, P = 0.007), external support (F = 4.03, P = 0.010), caregiver's routine (F = 3.82, P = 0.013), and total burden score (F = 4.02, P = 0.010) of burden. Tukey's test applied to see the differences in the burden of care among different anxiety disorders had revealed significantly higher burden in the domain of physical and mental health between GAD as compared to both anxiety NOS (P = 0.022) and phobia (P = 0.043). Similarly, significantly higher burden was observed in the domain of external support between GAD as compared to anxiety NOS (P = 0.020). Significantly higher burden was observed in the domain of caregiver's routine (P = 0.023) and total burden score (P = 0.010) between GAD as compared to phobia. On ANOVA, significant difference was observed in the domains of spouse-related (F = 7.74, P = 0.001) and total adjusted burden score (F = 4.44, P = 0.015) across different durations of illness. Tukey's test had revealed significantly higher burden in key relatives of patients with duration of illness >4 years as compared to duration of illness 1–2 years in the domain of spouse-related (P < 0.001) and total burden score (P = 0.046). The present work was a noninvasive cross-sectional study of cases of anxiety disorders (except OCD) along with their key relatives. This study was planned as most studies carried out across the world have focused on burden in so-called “severe psychiatric disorders.” Studies on burden of care in anxiety disorders are scarce. Indian studies on family burden have chiefly focused on schizophrenia and affective disorders. Studies on anxiety disorders are few. Despite the high prevalence and chronic disabling nature of anxiety disorders, understanding of their impact on caregivers has been relatively neglected. OCD and posttraumatic stress disorder are the only anxiety disorders that have been studied. There is a significant lack of data about other anxiety disorders. Arbitrary minimum duration of 1 year of illness was taken because illness less than that of this period may not have been sufficient to produce any meaningfully measurable burden on key relatives. Patients with mental sub-normality, any significant physical disability, any other psychiatric disorder, and any major medical or surgical illness were excluded because these disorders have their own burden which has been proven in various studies  and that burden of these disorders would be added to that of anxiety disorders burden. For a purer sample and to assess the burden only due to anxiety disorders, we have excluded all patients/key relatives with co-morbid physical and psychiatric disorders. Total adjusted burden score in our study was 40.41, which falls in the category of mild burden. Maximum burden was found in the domains of physical and mental health (7.48 ± 1.74) followed by external support (6.81 ± 1.60), caregiver routine (5.62 ± 1.02), taking responsibility (5.43 ± 1.53). It was found that statistically significant higher burden was noted in the domain of spouse-related burden [Table 1] by females as compared to males (t = 3.81, P> 0.001). The reason for this being female spouse found it difficult to manage patient along with other responsibilities of the household besides full domestic responsibilities, illness of husband placed extra financial burden, and responsibilities on female spouses which added to their burden. Mors et al. also reported that female spouses feel more anxious, tired, frustrated, isolated, and greater work load in comparison to male spouses. Males were found to experience significantly more burden in the domain of caregiver routine (t = 2.36, P = 0.020). This was mainly because of job/occupation-related issues. Males also experienced significantly higher burden in the domain of support of patient (t = 2.76, P = 0.007), the reason for this was added cost (financial burden) of treatment for the patient. Males also experienced significantly higher burden in the domain of other relations (t = 2.58, P = 0.012). This finding is against the finding of Kumar and Mohanty who observed burden to be higher in the areas of external support, caregiver routine support of patient behavior, and caregiver strategies in caregivers of schizophrenia. Primary care givers of OCD patients as well as schizophrenia patients reported similar family burden with regard to disruption of family leisure, family interaction, and effect on physical and mental health. Statistically significant higher burden was noted in the domain of physical and mental health (t = 2.13, P = 0.036) and total burden score (t = 2.32, P = 0.023) in married key relatives as compared to unmarried key relatives [Table 1]. The reason for this was that when one partner becomes less functional, the shared responsibility of family falls entirely on the spouse/caregiver. The married key relative also has the responsibility of children. Married key relative also experienced significantly higher burden in total burden score in comparison to unmarried key relative. However, Srivastava found no correlation of marital status with burden, in caregivers of patients of schizophrenia. Significant higher burden was seen in the domains of physical and mental health (t = 3.52, P = 0.001), taking responsibilities (t = 4.59, P < 0.001), and total burden score (t = 2.22, P = 0.001), in key relatives residing in joint families [Table 1] when compared with key relatives residing in nuclear families. At the start of study we had expected the reverse as more people were available in joint families to care for the patient. During the study, it was discovered that in most families, no such sharing of burden occurs. Other members of the family took it for granted that the patient was the key relative's responsibility and did not even do what they would have otherwise done for the patient. This finding was similar to Kumar and Mohanty, who reported spousal burden of care in schizophrenia and found that joint family system contribute significantly to the burden but in the domain of spouse related. They found more burdens in nuclear family in the areas of external support and care giver strategies. No difference of burden according to family type was observed in the study by Jayakumar et al. who studied in key relatives of patients suffering from OCD. Significant (t = 3.09, P = 0.002) burden was noted in the domain of spouse-related which was more in urban area in comparison to rural area [Table 1]. They also experienced more burden in the area of caregiver routine (t = 2.36, P = 0.020), as key relatives of urban area had fixed routine and job and found it difficult to manage their routine. Statistically significant higher burden was noted in the domain of other relation in key relatives of urban area in comparison to rural area (t = 2.80, P = 0.006). According to Srivastava, there was low positive correlation in the domain of support of patient of urban areas, the remaining domains showed no significant correlation with urban domicile. Jayakumar et al. found no correlation of domicile with burden in the OCDs. Significant burden was noted in the domain of physical and mental health in 41–50 years age group in comparison to 18–30 years age group (P = 0.021). Key relatives of 41–50 years age group had more problems of their own health, even though not significant enough for exclusion along with patient's illness. Trivedi et al. also stated that age range above 45 years experienced more burden than middle age group in caregivers of patients of schizophrenia, which is similar to our finding. The study of Li et al. with schizophrenia showed that the age of caregiver was positively correlated to burden of caregiver. Younger age of caregiver resulted in increasing sense of life being worth living. It was found that statistically significant higher burden was noted in the total burden score in the age group of 31–40 years as compared to 18–30 years (P = 0.004). Key relatives of 31–40 years age group were mature and married, had to bear more family responsibilities. There was no difference in burden in relation to age in a study by Jayakumar et al. on OCD. Significantly higher burden was found in the domain of support of patient in middle school to intermediate group as compared to graduate and above group (P = 0.048). This is because key relatives educated up to graduate and above had better knowledge about nature of illness and they sought treatment early resulting in lesser burden. Srivastava in a study on schizophrenia observed that the educational level of the patient did not have any significant correlation in any of the domains of Burden Assessment Schedule. There was no association between educations of caregiver and burden in the study by Jayakumar et al. in patients of OCD. A study by Gopinath and Chaturvedi stated that caregivers who are more educated experience greater burden in comparison to less educated caregivers in patients of schizophrenia. Statistically significant higher burden was found in total burden score in the income group of “up to Rs. 2500” in comparison to the income group of “more than Rs. 7500” (P < 0.001). key relatives of income group of “up to Rs. 2500” had more difficulty in bearing financial expenditure, as they mostly belong to semi-skilled and unskilled laborer group and had to earn on daily wages. They were often the only earning family member. Significant higher burden was found in the domain of patient behavior and total burden score in income group of “up to Rs. 5001–7500” in comparison to income group “more than Rs. 7500” (P < 0.021) due to similar reasons. Significantly higher burden was found in the domains of physical and mental health (P< 0.001) and total burden score (P< 0.001) in spouses as compared to siblings. The reasons for this finding being, spouses were spending more time with the patient and were usually unable to get support from any other family member. They also had responsibility of children and more domestic responsibilities. Jayakumar et al. revealed that the burden was high among spouses than other relatives in OCD which is similar to our findings. Statistically significant higher burden was found in the domain of taking responsibility (P = 0.036) as well as total burden score (P = 0.002) in spouses in comparison to parents due to similar reasons. In a study by Trivedi et al. found that parents and siblings of schizophrenic patients experience more burden in comparison to spouses. Statistically significant higher burden was found in the domain of “spouse-related” in duration of illness >4 years compared to duration of illness 1–2 years (P< 0.001). Key relatives of the patients in whom the duration of illness was between 1 and 2 years were able to adjust with domestic responsibility and would feel satisfied with the quality of marital life in the initial period of illness, but with time they feel exhausted and tired with extra responsibilities and would feel unsatisfied. Statistically significant higher burden was found in the total burden score in duration of illness >4 years compared to duration of illness 1–2 years (P< 0.046). Key relatives of patients of 1–2 years illness were more hopeful and perceived less burden as well as the support of neighbors and other family members also gradually reduced with time. There was a positive correlation of family burden and duration of illness as observed by Vohra et al., in patients of schizophrenia. Higher burden was noted in the domain of physical and mental health for key relatives of GAD as compared to key relatives of anxiety NOS (P = 0.002) and phobia (P = 0.043). The reason for this may be the persistent symptoms of GAD as compared to less severe/episodic symptoms of anxiety NOS and phobia. There was also statistically significant higher burden in the domain of external support in the key relatives of GAD in comparison to anxiety NOS (P = 0.020). The explanation for this finding is that key relatives of anxiety NOS patients needed only occasional support from others in comparison to GADs whose key relatives needed support most of the time. It was found that burden in the domain of caregiver routine (P = 0.023) and total burden (P = 0.010) was more in key relatives of patients with GAD in comparison to key relatives of patients of phobia. This finding is similar to that of a study by Hoffman et al., which can be explained by the nature of GAD being a chronic disorder and severely and persistently affecting all areas of life in comparison to phobia. GAD was associated with a significant lower likelihood of recovery from social phobia and a higher likelihood of its subsequent recurrence so that high human and health care burden in GAD was found. There is no blinding in our study, which is a major limitation of our study. In our study, severity of anxiety and burden on key relatives and disability were assessed by the same person, so chances of bias during assessment cannot be excluded. Further, sample size of panic and phobic disorder was too small for meaningful interpretation. Also, this study could not assess that how much burden was experienced by the patient himself. Further research in a large sample is needed to understand the psychodynamics of burden of care. The key relatives (caregivers) of patients suffering from anxiety disorders face significant burden of care which adds to their stress levels. This area is understudied and needs further research, as stress is an important attributing factor for anxiety disorders. Hence, the stress of the caregivers of patients suffering from anxiety disorders needs to be addressed. Identifying the domain commonly affected due to burden of care of their patient will help in finding a solution for it. World Health Organization. The Global Burden of Disease: 2004 Update. Geneva, Switzerland: WHO Press; 2008. Angst J, Vollrath M. The natural history of anxiety disorders. Acta Psychiatr Scand 1991;84:446-52. Schatzberg AF. Overview of anxiety disorders: Prevalence, biology, course, and treatment. J Clin Psychiatry 1991;52 Suppl:5-9. Grad J, Sainsbury P. Mental illness and the family. Lancet 1963;1:544-7. Fadden G, Bebbington P, Kuipers L. Caring and its burdens. A study of the spouses of depressed patients. Br J Psychiatry 1987;151:660-7. Chandrasekar CR, Ranga Rao NV, Murthy R. The chronic mentally ill and their families. In: Bharat S, editor. Research on Families with Problems in India. Vol. 1. Bombay: Tata Institute of Social Sciences; 1991. Senaratne R, Van Ameringen M, Mancini C, Patterson B. The burden of anxiety disorders on the family. J Nerv Ment Dis 2010;198:876-80. World Health Organization. The ICD-10 Classification of Mental and Behavioural Disorders: Diagnostic Criteria for Research. Geneva: World Health Organization; 1993. Thara R, Padmavati R, Kumar S, Srinivasan L. Instrument to assess burden on caregivers of chronic mentally ill. Indian J Psychiatry 1998;40:21-9. Yusuf AJ, Nuhu FT. Factors associated with emotional distress among caregivers of patients with schizophrenia in Katsina, Nigeria. Soc Psychiatry Epidemiol 2009;127:9-16. Mors O, Sørensen LV, Therkildsen ML. Distress in the relatives of psychiatric patients admitted for the first time. Acta Psychiatr Scand 1992;85:337-44. Kumar S, Mohanty S. Spousal burden of care in schizophrenia. J Indian Acad Appl Psychol 2007;33:189-94. Srivastava S. Perception of burden by caregivers of patients with schizophrenia. Indian J Psychiatry 2005;47:148-52. Jayakumar C, Jagadheesan K, Verma AN. Caregiver's burden: A comparison between obsessive compulsive disorder and schizophrenia. Indian J Psychiatry 2002;44:337-42. Trivedi JK, Dalal PK, Kalra H. Family burden and coping strategy in relatives of schizophrenic patients. Indian J Psychiatry 2003;Suppl:106. Li J, Lambert CE, Lambert VA. Predictors of family caregivers' burden and quality of life when providing care for a family member with schizophrenia in the People's Republic of China. Nurs Health Sci 2007;9:192-8. Fujino N, Okamura H. Factors affecting the sense of burden felt by family members caring for patients with mental illness. Arch Psychiatr Nurs 2009;23:128-37. Gopinath PS, Chaturvedi SK. Distressing behaviour of schizophrenics at home. Acta Psychiatr Scand 1992;86:185-8. Vohra AK, Garg S, Gaur DR. A study of burden on families of schizophrenia and depressive disorders. Indian J Psychiatry 2000;42(Supp):33. Hoffman DL, Dukes EM, Wittchen HU. Human and economic burden of generalized anxiety disorder. Depress Anxiety 2008;25:72-90.